No better period can be found for examining the press of Toronto than in the 1870s by which time the list of publications was long, the types varied, and experiment common. 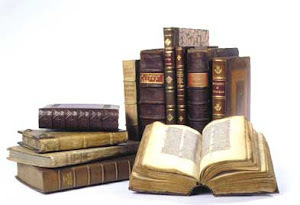 The churches were active in publications relating wholly or in part to religion. The doyen was the Christian Guardian, organ of the Wesleyan Methodists since 1829 and made famous by Egerton Ryerson who was editor for three periods. The Methodist Book Room also brought out the monthly Canadian Methodist Magazine. From 1857 to 1884 the Primitive Methodists published the Christian Journal, a weekly which carried general news and claimed to be not ‘intensely denominational’. The Presbyterians had a weekly, the Canadian Presbyterian, and the Baptists the Canadian Baptist. The division in the Church of England between high and low church was shown in the fact that for twenty-five years before they merged the Dominion Churchman was paralleled by the Evangelical Churchman. Sunday school papers and improving home reading such as Golden Hours for the Young and Pleasant Hours were numerous and often short-lived. On a subject that deeply concerned some of the churches and all in some way was the Canada Temperance Advocate. What’s so important about the 1874 Methodist Conference at Napanee? During most of the 19th century, there were several Methodist denominations active in Ontario. The two largest groups were the Wesleyan Methodists and the Methodist Episcopalian. The Wesleyan Methodist Church was founded by missionaries from the United Kingdom and organized in a similar way to the English Methodist Church. 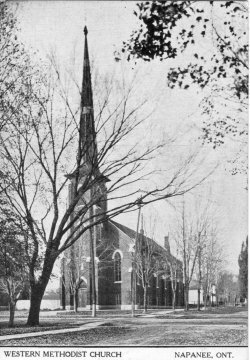 The Methodist Episcopal Church, however, was founded by missionaries from the United States and grew out of the revivals and “awakenings” of the frontier. The Methodist Episcopals believed in the ordination of Bishops, while the Wesleyan Methodists did not. The Methodist Episcopals resisted working with government even on issues of education and morality, while the Wesleyans believed this to be a way of influencing society for good. Although there had been efforts to unite all Canadian Methodists as one church, they had been unsuccessful. Partly because of the “movers and shakers” in the area at the time, little Napanee was chosen for the Conference. With a shortage of local hotel rooms suitable for “men of the cloth”, delegates were billeted with private families. Almost every local Protestant church had at least one guest preach a sermon. Between sessions, Dundas Street was flooded with serious, black-suited gentlemen, some of whom were quite eccentric having wild uncut hair or enormous patriarchal beards. The Napanee Standard, whose editor was a Presbyterian, found the situation quite comical. But inside the Conference, some serious matters were being discussed. Decisions made by such religious congresses would ultimately move the new province of Ontario away from the agrarian past. The roots of the United Church of Canada are here as well as deliberations which would effect the history of Victoria University. Rev. Homer Eaton, D.D., is described as the junior delegate from the United States. (Senior delegate was Dr. Hill.) Rev. Eaton was from Albany, N.Y. The Napanee Standard commented, “Rev. Eaton discoursed ably and masterly from Corinthians II 1 chap., v. 21 and 22.” Homer Eaton was born in Vermont in about 1835. In 1881, he was stationed at Saratoga Springs, N.Y. At the time of the Napanee Conference, he was about 39 years old. Rev. J. Gardner, was at that time the Editor of the Christian Advocate. We are somewhat unclear which Christian Advocate but likely this was the newspaper published by the Methodist Episcopal Church in America from New York State. Wesley Rev. Aubrey S. Tuttle M.A. Edison Rev. T.H. Boyce B.A. 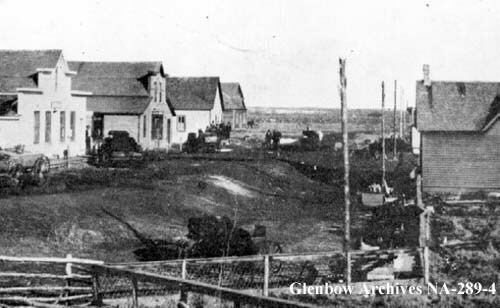 Lloydminster Rev. W.J. Wilson B.A. Olds Rev. T.J. Johnston M.A. PhD.